Simon Gunson of New Zealand provides some reader input, Sunday, July 29, 2007, on the disappearance of SS Obergruppenführer Hans Kammler. Photo from David Irving's The Mare's Nest and his forthcoming Heinrich Himmler biography: June 1943, the Reichsführer SS visits Peenemünde Test Rig VII, and watches two V-2 rockets being launched. On his left Colonel Leo Zanssen, the site's commandant (Peenemünde archives, Deutsches Museum, Munich). Where did Hans Kammler go? Re: ALAN Heath's comments about SS Obergruppenführer Hans Kammler's disappearance. I respect his sincerity and scholarship, but his comment about [the submarine] U-997 is a diversion. The truth is suggested by Farm Hall transcripts which are alluded to elsewhere on your website David, about comments which Gen Walter Dornberger is reported to have made in British captivity. The British noted Dornberger telling another German officer how he and Dr Wernher von Braun visited Lisbon in October 1944 to negotiate with two officials from General Electric. By this stage of the war, the SS had taken over the V-2 project. This trip to Lisbon was highly treasonous and unlikely to have occurred without Kammler's personal sanction. Another point is that Kammler disobeyed Hitler's "Nero" decree in March 1945 to execute 450 engineers at Peenemünde, and had them secretly shipped south by train along with tons of rocketry documents. Kammler also discreetly shipped Nazi nuclear scientists south to Bavaria in 1945. The Americans and in particular Colonel Boris Pash of ALSOS suddenly changed direction in March 1945, switching their emphasis from reaching Berlin to an amazing push all the way to reach Austria and Czechoslovakia. 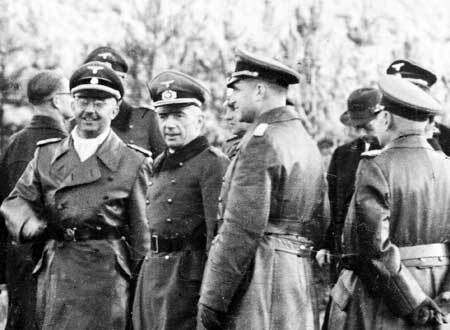 Along the way ALSOS met no resistance and easily captured top Nazi scientists and engineers. This is the true clue as to Kammler's disappearance. He was co-operating with the American OSS and Operation Paperclip. He did not need to escape by U-boat.